The next day my journey took me along I40 into New Mexico. I’d decided Texas was not a place I wanted to live, so I pressed on in search of a new home. I’d done some traveling around the country during my ten years with Harry, and we’d moved house many times within the town of Elkhart. After Harry’s abusive outburst at the house on the Michigan/Indiana State line, I’d gone to stay with Mary and Roy for a while. The day after the beating, I’d returned to the house with a police officer to get my car. There was no sign of Harry and the police suspected he was in Michigan. The beating had taken place in Indiana so they couldn’t arrest him in Michigan. How convenient for him that the State line was only one house away. I was surprised and dismayed to see that Harry had cleaned up everything inside the house. The bedroom was clean and vacuumed. A few of my clothes lay limply on hangers in the closet and I found one photo album and a few personal effects, but most of my stuff was nowhere to be found. I searched everywhere, including the trash, but found only a couple of torn photographs on the garage floor. There was no sign of my passport or my mother’s jewelry. I realized that the garbage truck had come that morning and all my stuff was gone. I packed the few things that were left and gathered the torn pictures off the floor. With tears running down my swollen cheeks I gently wiped the dust off a torn picture of my parents and my brother’s little boy, Timmy. “Oh mum, how I wish you were here,” I said aloud as fresh tears brimmed in my eyes. Gently I eased myself into the car, my head spinning and throbbing from the huge lump I had on the back of my skull. The bruises on my back burned as I leaned back into the seat. “You’re going to press charges right?” said the police officer before I drove away. “I’m so sorry, believe me, I hate myself for what I’ve done. I’m very, very sorry. Please forgive me. I love you, I didn’t mean to hurt you, it’s just that I don’t want to lose you, and well, I just couldn’t bear the thought of you with another man. I love you that much.” Harry’s voice was choked with emotion, and it was clear that he was crying. I hung up the phone and turned to Mary’s open arms for comfort. “Maybe he’s really sorry.” She said. For the next two days, the phone rang regularly. One of those times Mary spoke to Harry, she said she thought he was genuine and that he really sounded sorry, and he kept on promising to quit drinking. I felt my resolve weakening. I was just about to agree to meet him when Harry threw another blow at me, only this one wasn’t from a wooden stick. This time I dropped the phone in horror. I wasn’t sure what gonorrhea was, but I got the general jest of the word. He had some awful disease he’d contracted sexually and had passed it on to me. Mary pulled out a medical dictionary, and we looked up the disease. We learned that it can take up to thirty days for symptoms to show and that the disease can cause internal abscesses and long-lasting, chronic pelvic pain. It can also damage the fallopian tubes enough to cause infertility or increase the risk of ectopic pregnancy. Ectopic pregnancy is a life-threatening condition in which a fertilized egg grows outside the uterus, usually in a fallopian tube. I was horrified and rushed to the bathroom sick to my stomach. That afternoon I went to the clinic and was tested for HIV and gonorrhea. That night and the next day, I sat and wept. I’d not get the test results for a few days, and then I’d have to take more tests in a few weeks. If the tests came back positive, my life would be ruined. Mary despaired as I moped around the house not wanting to eat or do anything. The beating seemed mild compared to this blow. How could he do this to me, what had I done to deserve this? Two days later the phone rang, and Harry was on the other end sobbing. He sounded so broke up and sorry, and now that my bruises were fading and the swelling on my head was gone, I found my resolve weakening. Mary also felt that he was genuine, and I listened to her as she slowly convinced me to give him another chance. Besides, I wanted my passport and mothers bracelet back, it was a family heirloom, and I had to have my passport. So we met, and once I saw his grief, and saw how much he missed me and loved me and needed me to help him, I couldn’t refuse. I was weak, unable to knock him down any more than he already was. We found a basement apartment in the town near the railway tracks, and for a while, he cut down on the drugs and tried to give up the beer. Things were a little calmer, at least for a while. I had filed a police report against Harry but once we were back together, I couldn’t very well follow it through, so dropped the case. Because all of this happened in Indiana, Harry managed to avoid any repercussions with his Parole Officer in Michigan. Harry said he’d not done jail time for his crime. He told me about it a few weeks after we’d met and had convinced me the whole thing had been an accident. Apparently, he’d been at a friend’s house one summer afternoon when things got a little rowdy. An argument broke out on the front lawn of the house and Harry and another guy had tried to break it up. Harry had been outside grilling steak and was holding a huge kitchen knife. At one point in the argument, one of the men stumbled onto Harry’s knife. The Carving knife was about six inches long, but only the very tip actually punctured the flesh of the rowdy drunk. The injured man had called the police accusing Harry of trying to stab him. His story seemed to make sense, and I believed him. Now, ten years later, I was driving into the west in search of a new home. I wished I could shake off the horrible memories of the past, but somehow thinking them over again made the here and now twice as miraculous and beautiful. I was free; I could go anywhere I wanted and choose my own home. My new home would not be an apartment, I had no desire to listen to other families arguing through wafer thin walls. Nor would it be in a basement. Never again would I live in a basement, not after what happened in the third home Harry and I shared. I shook my head to dismiss the memory. Ahead of me, the road disappeared into a rugged terrain of sandy cliffs that jutted out from the desert floor, and in the far distance, mountains rose. A flutter of anticipation made itself known as I peered at the mountains. real mountains. How long had it been since I’d seen real mountains? Ten years, twenty? I couldn’t wait to get there. However, it was time to find a place to stay the night. My internal clock had grown used to this new pattern in life. Each day on the road, a little alarm started to go off in my head as the time approached five o’clock. I’d learned that if I found a campground before 6:00 PM, I’d have time to set up camp, explore and cook dinner before darkness fell. It was no fun setting up in the dark, even though I could practically set up and take down the tent with my eyes closed now. The first State Park I found had no kind of shelter from the sun or wind, and I was convinced that without a shelter I would fry, then all the moisture in my body would evaporate and become one with the clouds. After that boring end, my dried up body would be blown away by the ceaseless wind that engraved this wild landscape. Conchas Lake State Park was next, and thankfully, it had stone shelters at each campsite. After wrestling the tent into place, I had a severe case of dust mouth. With little else to do, I crawled inside, zippers closed tightly against the desert dust that swirled around and found it’s way into every pore and every crease of clothing. I’d been sending daily letters to my family in England, telling them about each road and adventure, so now I wrote and read until at around 7:30 PM when the temperatures took a drastic nosedive, and I decided to sleep. In the morning, I went to pay for my campsite as I’d not had the correct change the night before. A very handsome, Hispanic looking ranger dismissed my money, and let me go at no charge. I was amazed at how nice everyone was being, my world kept getting brighter by the day. Day thirteen of my adventure took me through the Sangre de Cristo Mountains and into Santa Fe. The mountains were rugged and the views more breathtaking every mile. I was at the southern end of the Rocky Mountains now, and though it was still sunny, it was quite a bit cooler and I realized that my eighty-degree days might soon run out. I walked around Santa Fe and treated myself to lunch, justifying the cost by not having to pay for the campsite last night. I’d been very careful with my money while traveling. At MacDonald’s, I’d saved the ketchup packets, sugar, creamer and any other sauces that came my way, and in public bathrooms, I’d rescued the ends of toilet rolls so as not to buy toilet paper. My diet was very limited and consisted mostly of peanut butter sandwiches and baked beans. I usually treated myself to a steak or pork chop at night, which I cooked over the fire. One time I’d had bacon and eggs, and it was delicious. At each State Park I’d hiked and explored, and now as I looked at my reflection in the gallery windows, I was startled to see a stranger peering back. I took a step forward and turned to view my body sideways. My grubby clothes hung limply, and despite their bagginess, it was clear that underneath was a body that no longer filled out the size fourteen clothes. I was delighted, and just for the fun of it I went into a clothing store and tried on a size twelve pair of shorts. They zipped up easily, and I did a little dance in front of the full-length mirror. I couldn’t afford to buy the shorts, so I returned them to the sales clerk, who eyed me disgustedly, and I left smiling from ear to ear. An hour in Santa Fe was enough. My nerves started to frazzle with all the noise and bustle. Dollar signs flashed before my eyes and I cringed at the wealth flowing around me. 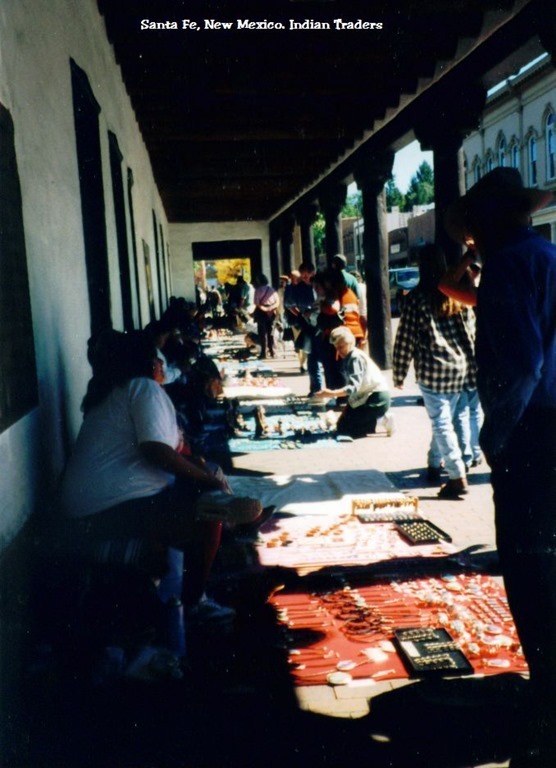 I enjoyed the Native American street vendors sitting on rugs in the street with their wares laid out before their feet. Brightly colored southwestern style jewelry, ponchos, and handmade rugs gave the air a festive flair. However, I had no need for any of these items, what good would jewelry do me while living in a tent. I got dizzy trying to find my way out of the hectic downtown area and was just about to start screaming when I miraculously found the right road, heading north into Hyde Memorial State Park. The campgrounds were a mess as the forest service was repairing the roads. I grew anxious and fearful that I wouldn’t find a place to camp, but finally, I did and the rate was only $6.00. With my tent set up, I decided to burn off some more fat with a little hike and set off up the trail at my usual pace. After about a quarter mile going uphill through dense stands of evergreen trees, I got dizzy and nauseous. I stopped and gulped air deeply, no matter how much I breathed in, it didn’t help and feeling sure I was going to waste my lunch and possibly faint, decided to head back to the tent. As soon as I started back down the trail I felt better, and couldn’t figure out what had happened. It was later while resting in my tent and reading brochures that I learned about altitude sickness. The brochure explained that shortness of breath, nausea, dizziness were all signs of altitude sickness. I was supposed to drink plenty of water and walk slowly, allowing my body time to adjust to the height. I found this news exciting, the thought that I was high enough up to affect my body, made me feel like a true adventurer. Here I was in the Rocky Mountains, with bears and deer in the woods around me, and temperatures that were plummeting by the minute. This is living. That night, however, I wasn’t so sure about my adventure. I shivered under my one quilt, and tossed ceaselessly, unable to sleep, another side effect of altitude. In the morning, I woke stiff and cold and braced myself for a mad dash to the car for a sweatshirt, earmuffs, and gloves. While walking around the campground in an attempt to get my blood circulating, I ran into one of the other campers. The woman was walking briskly along with two little dogs in tow. One of the dogs had lost the use of its back legs, and in place of them were two tiny wheels strapped to the dog’s belly. He pulled himself along with the same enthusiasm as the other dog, sniffling at everything undeterred. When he got caught on a rock or twig, he pulled hard convinced he could make it on his own, but inevitably his owner would come to the rescue, then off he went again. The woman was camping alone in her Volkswagen van, and she explained that she was trying to get back on her feet financially after having left an abusive relationship. Once more, I was amazed at how almost everyone I met had some kind of connection with an abuser. After another hike, this time taking it at a snail’s pace and stopping frequently, I decided to head to Santa Fe again to buy a sleeping bag. Last nights experience proved my quilt was simply not going to cut it here in the mountains. I went into the store after store after store, growing more frustrated at the prices, I couldn’t spare $200.00. Finally, I found a hunting store that had a 15-degree sleeping bag for $89.00, and I broke down and bought it. I had some reservations about its quality, but I had little choice. I also bought a camp stove so I could brew a quick cup of tea in the mornings to warm me faster. I did some laundry, then quickly escaped the rat race, happy to leave the bedlam behind. In Albuquerque, I searched for the next State Park. After crossing the median several times, driving the same stretch of highway repeatedly, I finally realized the campground was right in the parking lot of a Casino. I was so tired from lack of sleep and frustrated to the point of tears with the traffic, I decided to get a motel. I must have looked rather pitiful, as the lady gave me a discounted rate without me even having to ask. With the luxury of a hot bath, a television, a soft bed instead of the ground and a toilet that didn’t shoot icy cold air up onto my buttocks, I felt pampered but strangely uncomfortable at the same time. There was a phone in the room, so I made a collect call to Hanna, Harry’s younger sister, and told her answering machine that I was okay. I left the phone number of the motel, in case she felt that Harry and I should talk. However, the phone never rang. The next day I got rid of yet more clothes that were far too big for me now. I was shedding the pounds, and with it went memories of my old life, my frumpy clothes were part of these memories. When I first met Harry I was slim and pretty, but living with him had limited my activities. He had banned me from the health club, despite it being all women, and he didn’t allow me to go anywhere to walk anymore. I think he feared that I would meet someone else if I went places, and so my world had grown smaller as Harry put more restrictions on me. Toward the end, my world had shrunk to the size of the house and yard. Before leaving the motel, I wrote another letter to my parents, and as I wrote the date, October 10, 1996, I realized that today was our wedding anniversary. All those years of trying to help Harry quit the drugs and booze. I’d given that man ten years of my life, five of them in wedlock. Yes, Roxy, you gave him 10 years, but aren’t you thankful it wasn’t twenty or more, like his mother. I left the motel feeling nostalgic, with memories of the past ten years flooding my senses, some of them were nice, but the ones that stood out most were the bad ones. It also took me 10 years to leave my psychopathic abuser, who didn’t need drugs or alcohol as an excuse. Unfortunately, those ten years had brought me two daughters, whom were handy tools to brainwash and use to continue his abuse, even to the current day. They are both now over 40 years old. I am sorry to hear that. It took me 10 years too, but I didn’t have to worry about getting pregnant. I hope that your daughters manage to come around and not pass on the trait. It does happen, and there is always hope. I wish the best for you and yours. Take care. Love your story and always look forward to the next chapter. Your writing is wonderful. So sorry for the pain you have had in the past, but look at you now!!! Inspirational!